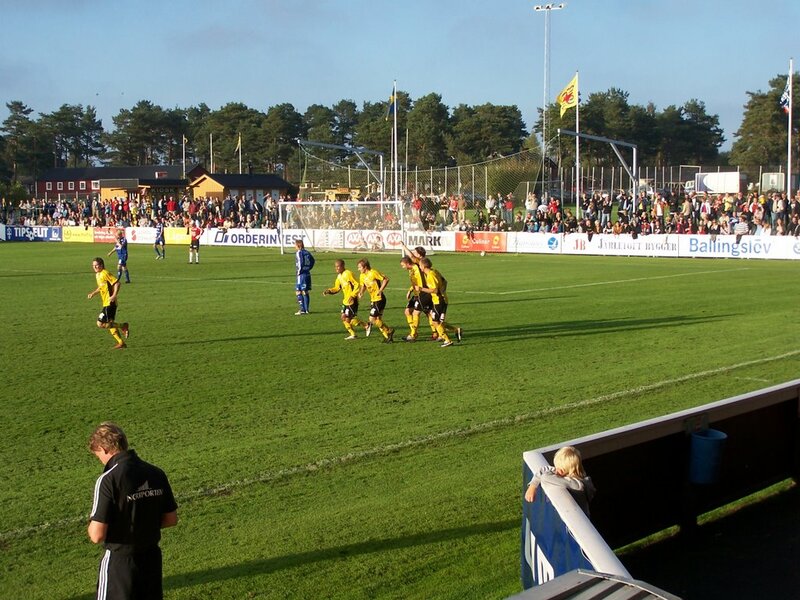 The last game of the season was played yesterday by the MAIF players away in Falkenberg. Despite the lousy weather (it started to rain just when the game started), it was a quite pleasant game. A lot of Strubbarna had made the trip (see SuperMink's pictures), and were singing and cheering all the players (including those who have decided to give a new orientation to their career) for most of the game. 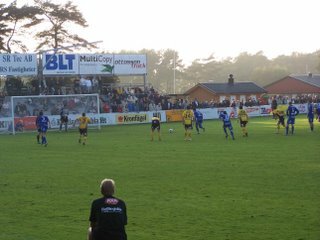 On the pitch, the Falkenberg players were not in their best day, so MAIF could make the game as they wanted. Less nice was the agressivity of the FFF players, a lot of ugly tackles and their specialty, the elbow in the back of the head on headers. Their captain was sent off after a very obvious and ugly one on Olsson which had to be changed for Berner. Not that it was necessarily a bad thing, it took a whole 3 minutes for Berner on the pitch to score a goal (0-3). A nice goal built by our youth, Wille and Alex to bring up the ball and Berner to finish off. Very promising for the future. Before that, Olsson had opened after a successful one-on-one duel against the FFF keeper. Good pass from Persson, terrible mistake from the FFF midfield and defense who are just watching and left an avenue in the middle and take a goal. This action was actually made by these only 2 players, Persson gets the ball at the central circle, brings it up a little bit, completely unchallenged, then pushes it in depth to Olsson who runs, captures it and finishes perfectly. Very nice action, like we have seen too many against us this season, good that we learn from our mistakes. Also very nice to see Olsson succeed in this situation, it has not been the case very often this year. 0-1. Just before the break, as usual we take it easy, and there comes a terrible mistake from Simon who makes a pass to the opposite attacker. Luckily for us, Dusan was excellent, and the FFF strikers not so much so. Still 0-1 at the break. Just after the break, Simon's out injured (or maybe it was his terrible mistake from some minutes before that cost him his place) replaced by Cederberg, and it's Eken's turn to score, after a pass from Sasa. I would like to tell you more about how this goal was made, but unfortunately, I was paying my korv at that very moment, only a few meters away. FFF has very good korv (sausage), especially the spicy ones (hint to the responsible of the korv at MAIF), but only 1 grill so we had to stand a long time in the queue, and so I missed this field action. Anyway, 0-2. And good korv. From about the 60th minute, the FFF were not seeing the ball very much anymore, it was all MAIF. The score stopped at 0-3, victory from Mjällby, equalizing what FFF gave us at home. Why haven't we played all games like yesterday? The conditions were far from ideal, it was not our field, but we dominated them. 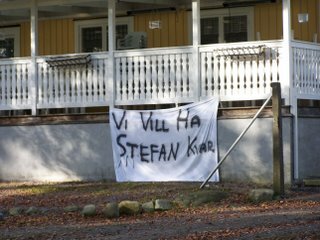 Same thing some weeks back against Väsby, we suffocated them. 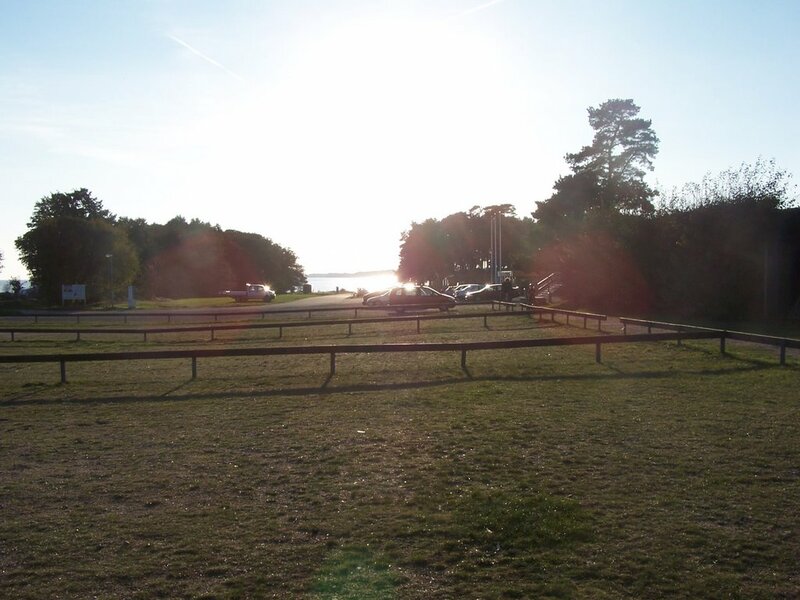 What is different during those games, that was not there against, say, Örebro or Degerfors? Why did we not win 7 games in a raw in the middle of the season, when the conditions were much better. 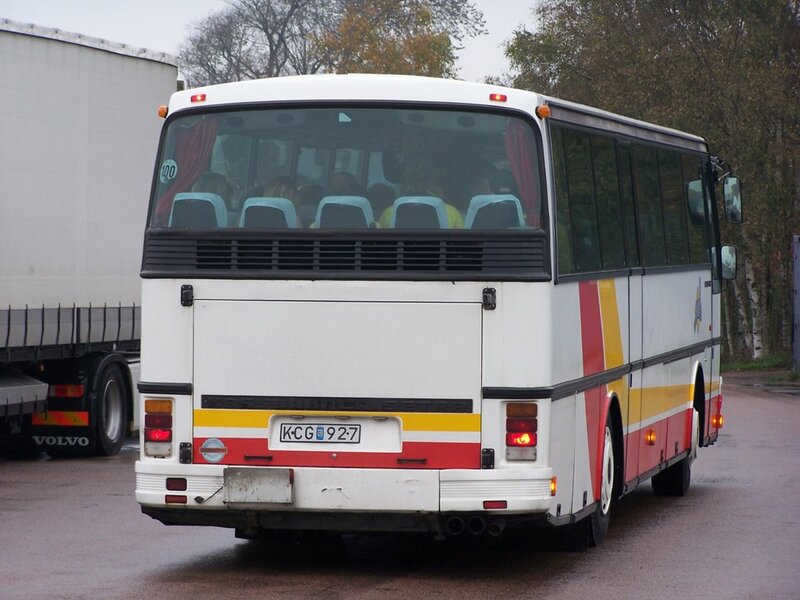 Bus of the Sillastrybarna in Snapparp. Classical. Only 684 people but 3 busses from Mjällby. President Janne giving the tempo. Alexander prefered to Jermaine Hue. In the back MAIF supporters and fog on the camera. 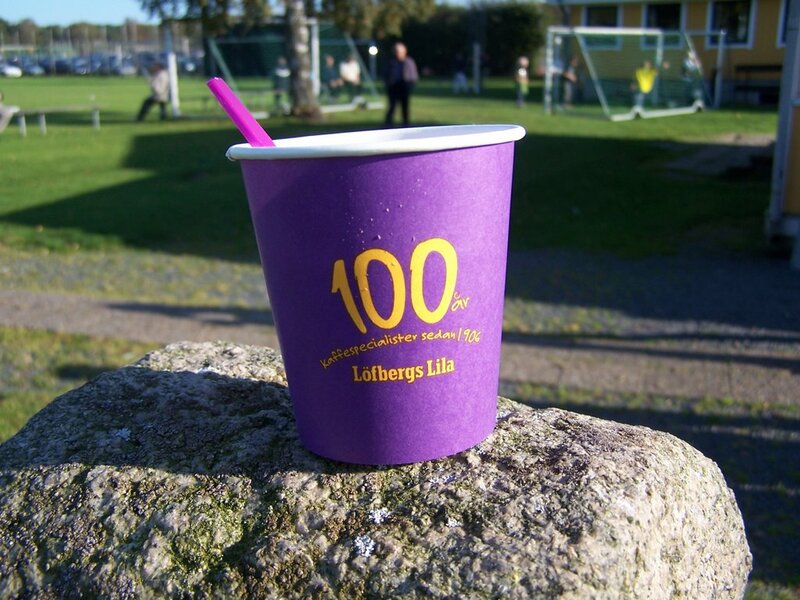 Half time 0-1 F. Olsson. Phille & Danne. Only D. Nilsson will enter. Simon Sjöförs let his place to Robin Cedeberg at half time. Last game for Simon ? 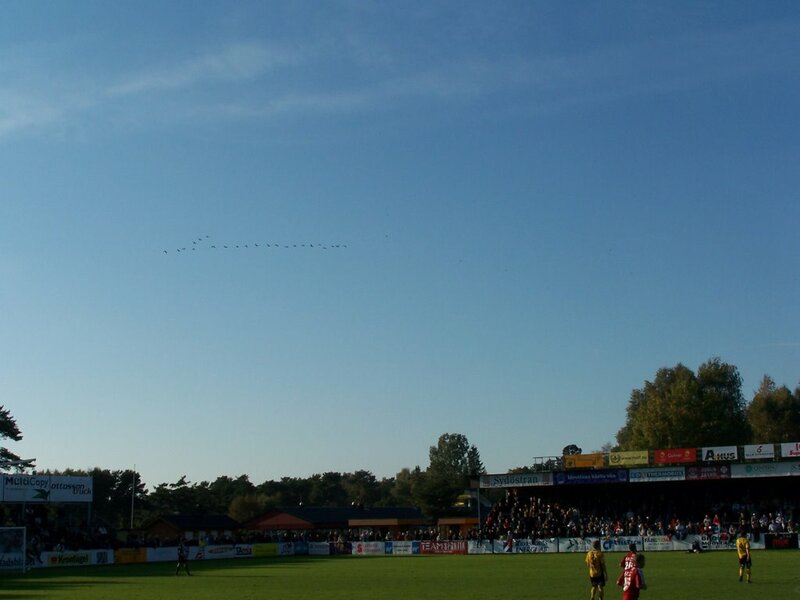 And the last game of the season at Strandvallen has taken place. 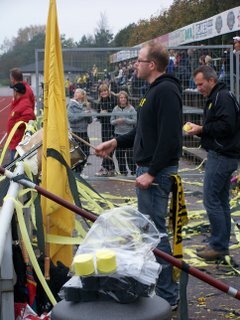 Something we can forget as soon as possible as it was a game with small value for a Mjällbysupporter (see pictures selection). Some highlights presented by Marcus Ekenberg was all. Adam Berner tried – and should actually also have gotten a penalty since he was cut down by Degerfors goalkeeper who caught his quick feet instead of the ball. But even if the referee was lousy we cannot blame the loss on him. 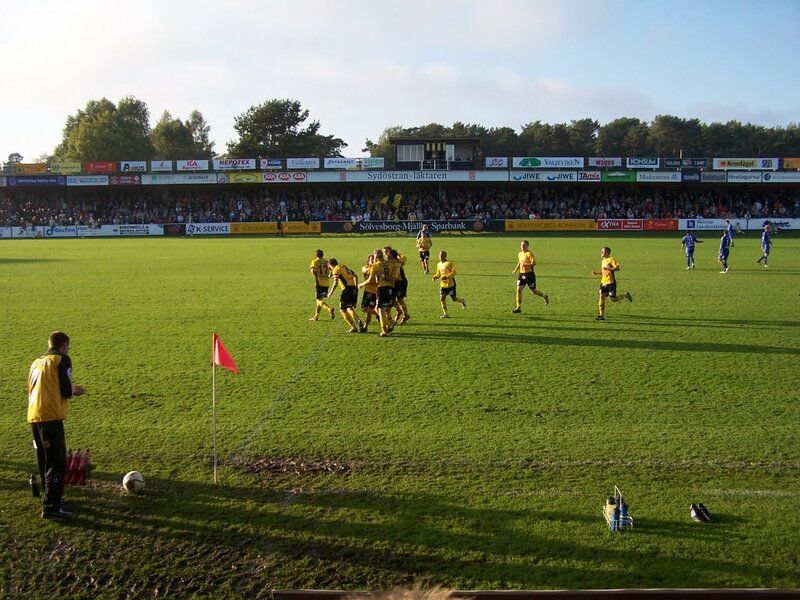 The black and yellow team did everything themselves to serve the opportunities to Degerfors. Like the first goal of the day which came already after 13 seconds (what, we have started?!). A Degerfors which of course was a lot more motivated since they fight for their survival and Mjällby already was safe – for the first time since 1999 (2002 they also didn´t have anything to play for since they already where signed for division 2). 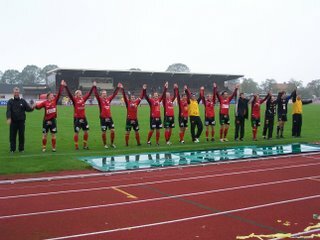 To close the season only one game remains, next week-end away game with Falkenberg. 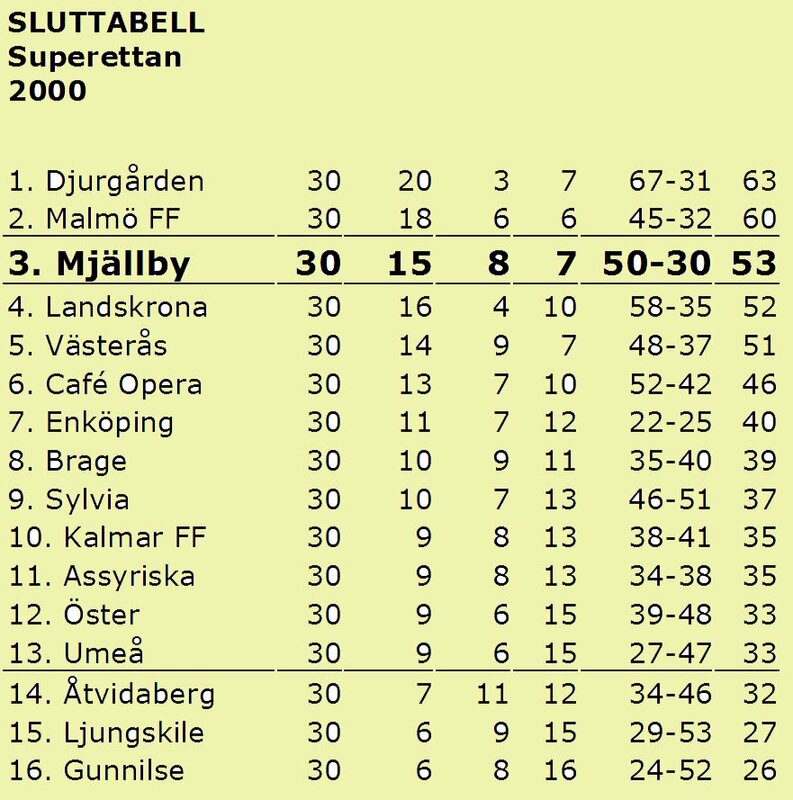 Mjällby as well as Falkenberg are both qualified for next years´ Superettan and have just the position to play for. The honour to finish in a good way? And some money from the federation as well. 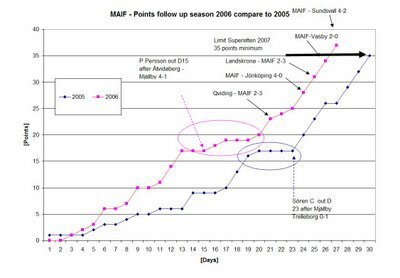 Every position gives some more money in the pocket for the Mjällby board who is talking about keeping this years troup as well as signing up some new names. 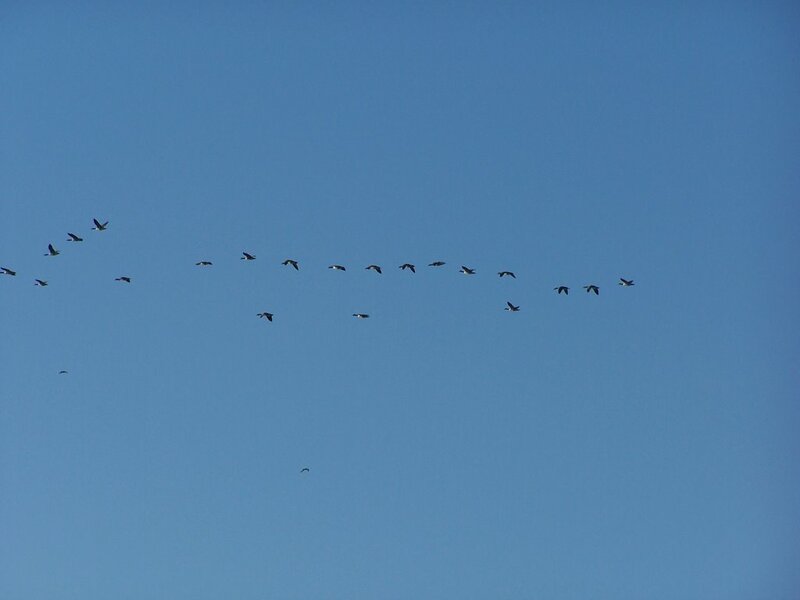 13:58. In 2 minutes: goal ! 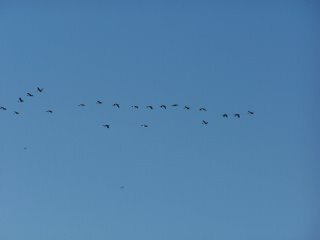 Geese in the sky 2. Last program of the season. 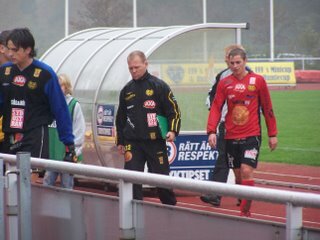 The game started without any pressure on MAIF, whose presence in SuperEttan next year is already secured. 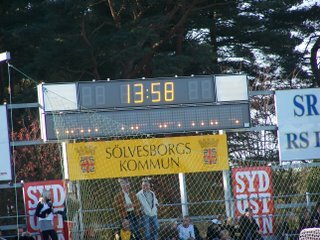 The pressure raised just a little when the away team scored at the 16th second, new record, although the previous was for us (courtesy Eken). The reaction was not obvious from MAIF's side. Degerfors was leading the game, we were making a lot of mistake, bad passes, defensive mistakes. 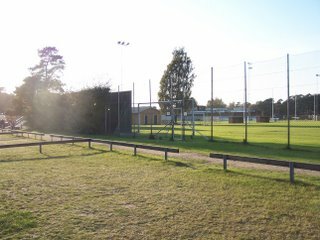 Then came 0-2, score at the half-time. Until then we had had only like 2 or 3 clear occasions. After the break, we take the same and start over. When Eken scores a terrible (and untakable) volley, we start believing again. But a (slightly doubtful) penalty shortly after cut those hopes. And the sum of mistakes leading to the final goal finished them off. Nobody performed very well today, everybody was below their potential, so I won't grade anyone in particular. 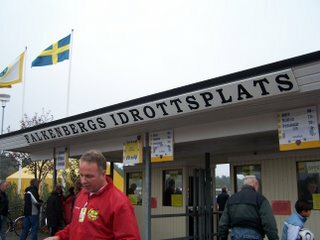 In an offensive layout with only 3 defenders, we were too passive, letting the Degerfors attackers do their game and bring up the ball almost unhindered. In the middle, not always somebody trying to receive the balls, and when we did we lost it shortly after. As for the attackers, the finishes were not good enough. Outside the pitch, ze Strubbarna were more or less in the same mood, sleepy. 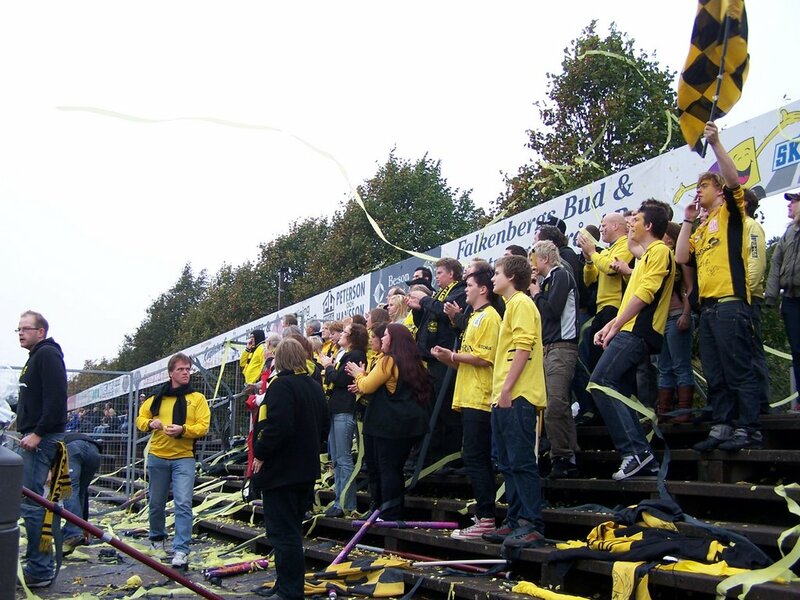 The 12 Degerfors supporters where making more noise. Worth noting is that Degerfors' keeper has been good, did some good saves. Also, ze Pajas was not on our side today either. Eken took a lot of beating by the same player on at least 3 occasion in the first half hour, and... nothing. At the very end of the game Adam Berner was taken down in the surface by Degerfors' keeper and... nothing. 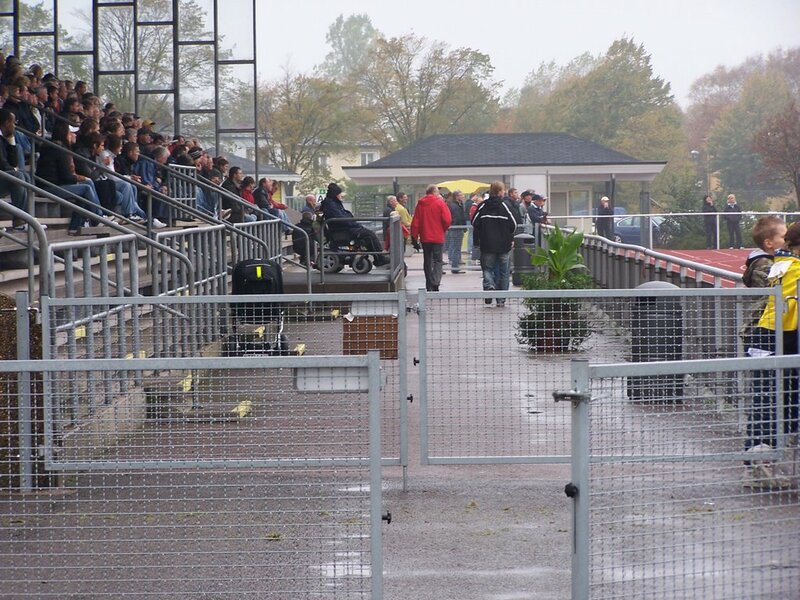 Mr Pajas let Degerfors play a very ugly football, where taking the players down had priority over getting the ball. A game to forget. Let's put it on the release of the stress for staying in the SuperEttan. 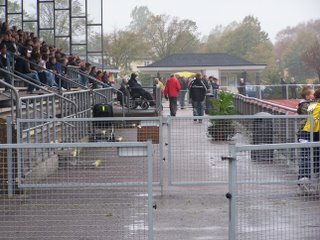 A little bit a pity for the (again) more than 2000 spectators that had come to see the same football as during the previous 9 games. 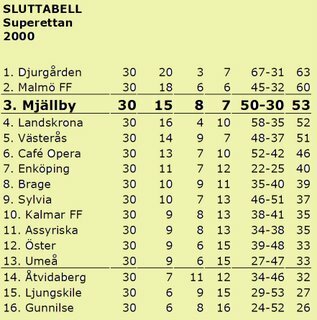 Just for the second time in 8 years Mjällby will play without pressure the last game at home... With 40 points there is no DANGER. 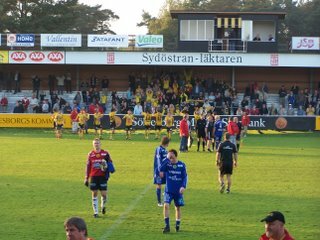 2005: Survival game against Boden with red card Lindberg after only 15 minutes... After this victory Mjällby stays in Superettan. 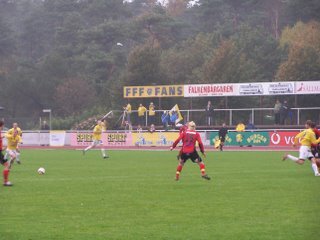 2004: Game against Huskvarna for qualification and of bunch of goals by Marcus Ekenberg. 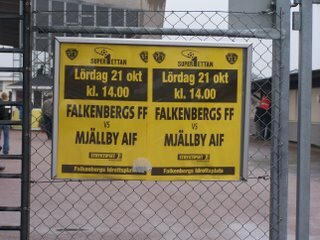 Mjällby goes to Superettan ! 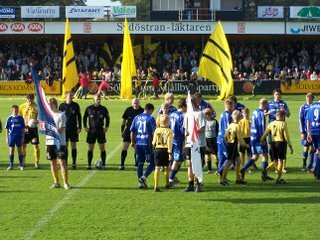 2003: Game against GAIS for qualification Superettan. 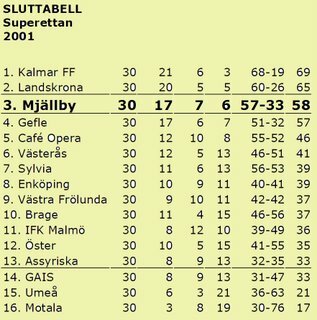 Mjällby stays in Division 1... GAIS was better. 2002: No pressure. 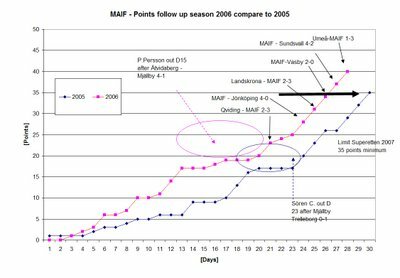 MAIF - the medias favourites for Allsvenskan - went down several days before the end of the season. Bad year. 2001: Qualification against Norrköping to go to Allsvenskan! 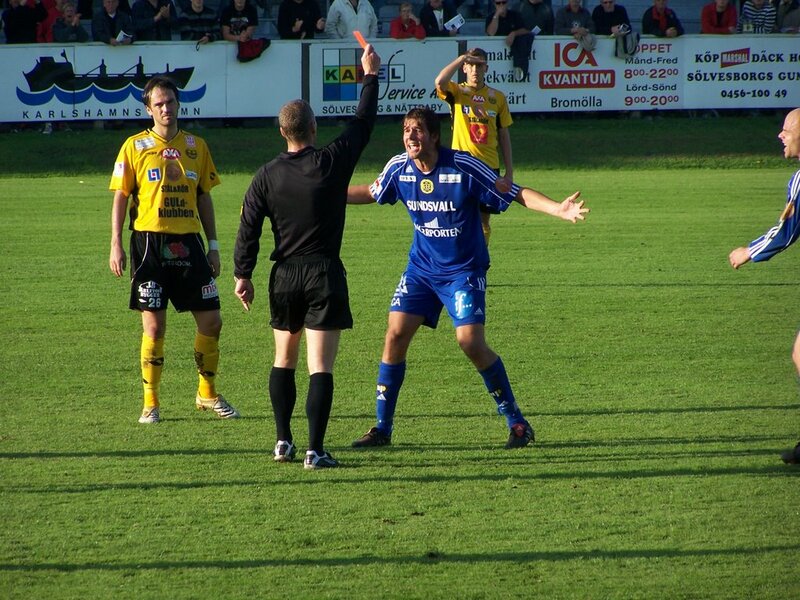 Mjällby stays in Superettan after a scandalous game away with a famous referee i will not give the name. Mourinho did. 2000: Qualification against Häcken to go to Allsvenskan ! 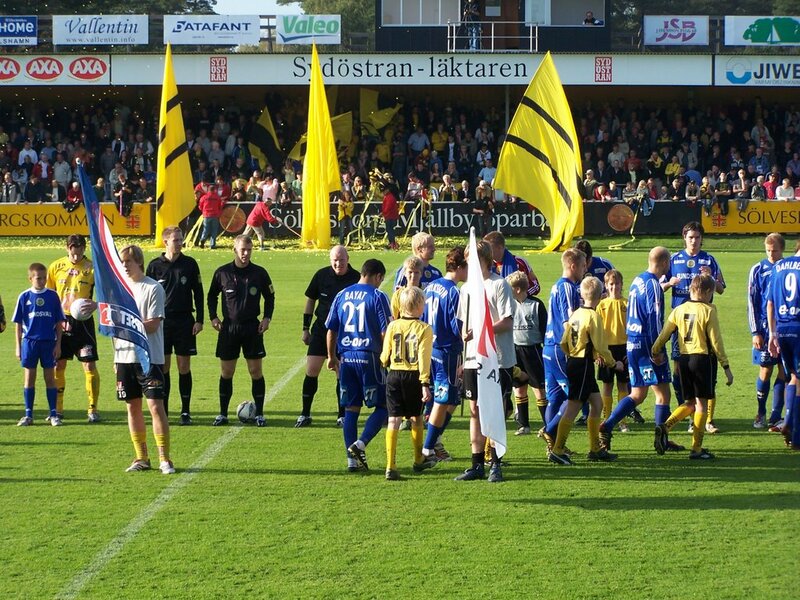 Mjällby stays in Superettan after loosing in penalty. 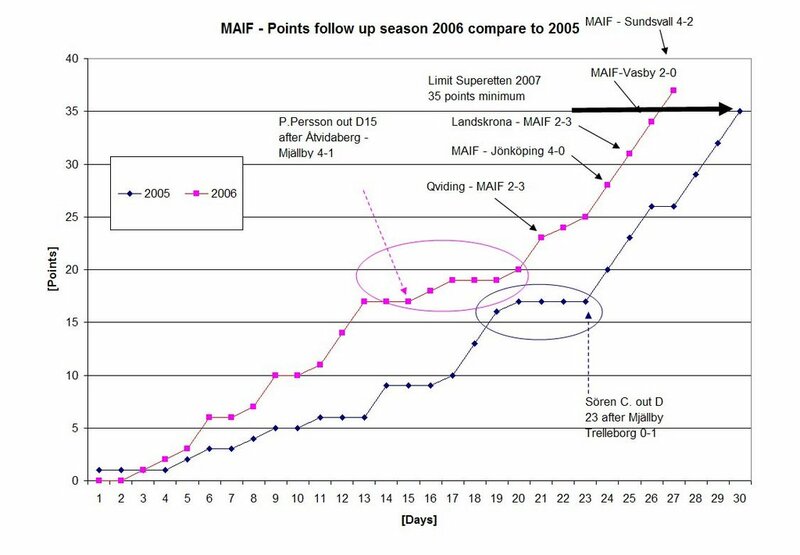 1999: MAIF (in Div 1 South, ex-Superettan) finally finished at the 4 th place and miss the qualification for Allsvenskan. Thank you to Blackcross for the tables. 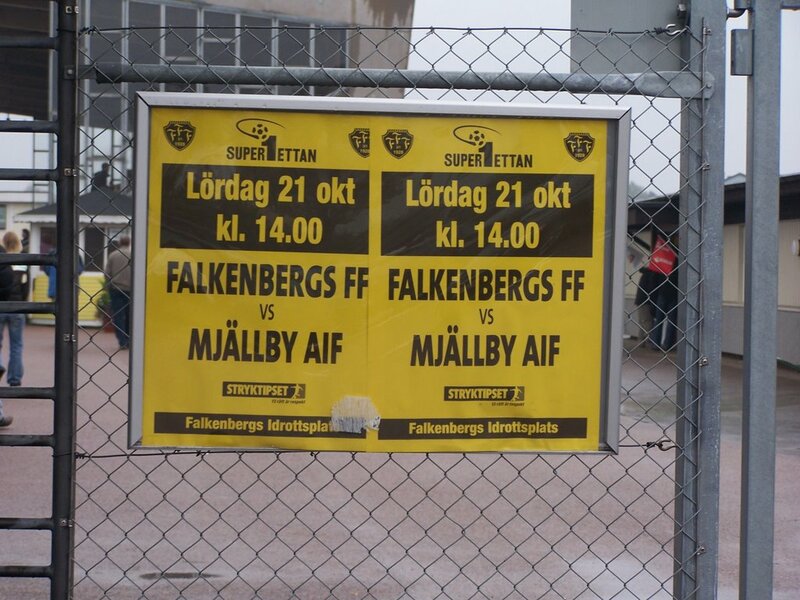 Mjällby will play in Superettan next year after the victory against Umeå away. There are two games still to be played but MAIF can not go down or play the qualification with 40 points. 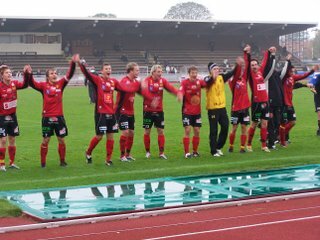 The team managed by Tomas Andersson has done a fantastic September-October months with 5 win in a row. 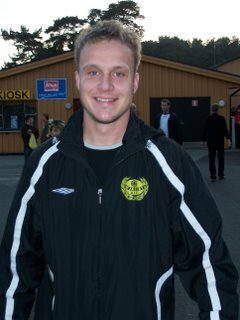 - Christian Fegler, the excellent second goal keeper is talking with Trelleborg which just got their ticket for Allsvenskan (info BLT during the week). If Fegler leaves, Dusan will stay. 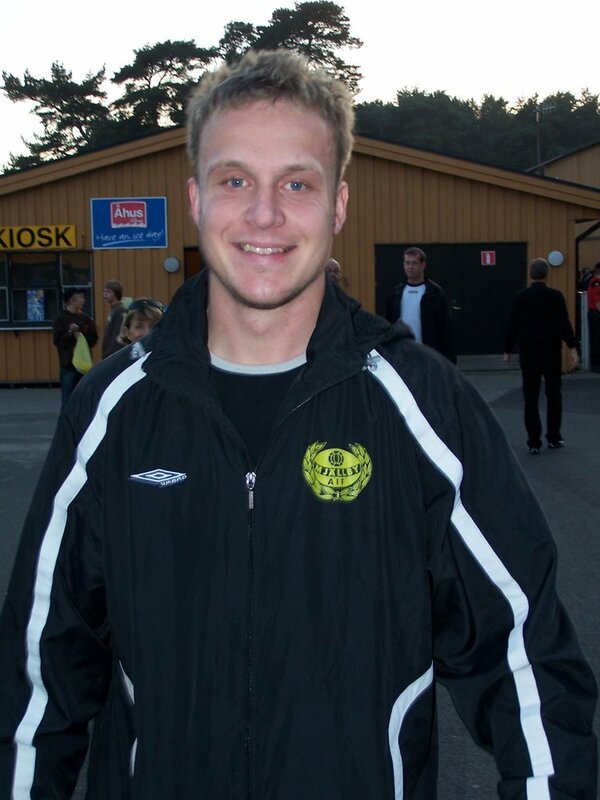 - Stefan Larsson, the best player and scorer of SGIF (second club of Sölvesborg commun) could join Mjällby next year but other club are intersted like Örebro or Kristianstad. 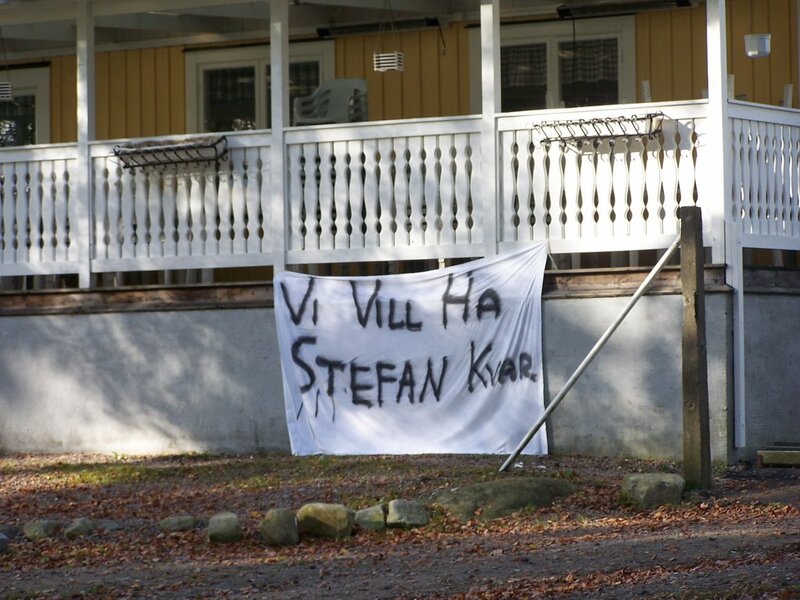 It seems that this year Stefan will leave despite the disapointment of the supporter, see the picture "We want Stefan to stay" put at the club house of the club on Sathursday 2-2 against Asmundtorps. - Jamaica beats Canada 2-1 on Sunday. Jermaine Hue has been excellent. The winner came after midfielder Jermaine Hue beat four defenders and played the ball to Phillips, who finished with clinical accuracy (Canadian Press). The Reggaeboyzs - supporters of the Jamaican National team - reports that Jermaine Hue has been called for at least one friendly game in Kingston Jamaica - towards Canada the 8th of October. It means that he will not play with Mjällby against Umeå. Jerry Hue could also be in the squad against Peru the 15th of November. His colleagues Teofore Bennett of Öster and Luton Shelton of Helsingborg IF are also called. SQUAD: Leighton Murray, Shawn Sawyers, Richard McCallum, Fabian Davis, Claude Davis, Damion Stewart, Shavar Thomas, Oneil Thompson, Xavean Virgo, Garfield Reid, Khari Stephenson, Omar Daley, Jamal Campbell-Ryce, Demar Phillips, Shane Crawford, Damion Williams, Sean Fraser, Ricardo Fuller, Teofore Bennett, Luton Shelton, Fabian Dawkins, Kavin Lamey, Wilfred Smith, Roland Dean and Jermaine Hue. 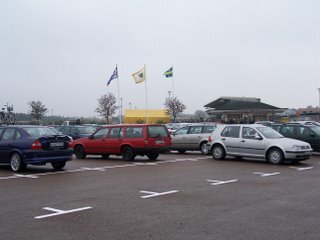 Presentation of the teams 15h55. Red card for brutality justified for away team forward. Everybody congratulate Simon for his 40 meters goal (2-1). Dusan coundn´t nothing against that penalty (4-2). Public more than satisfied. 4 victory in a row. MAIF - MAIF - MAIF !! 3 goals today and 12 since the begining of the season. Good job ! Here is the graph who have been so many to ask me (eh eh). 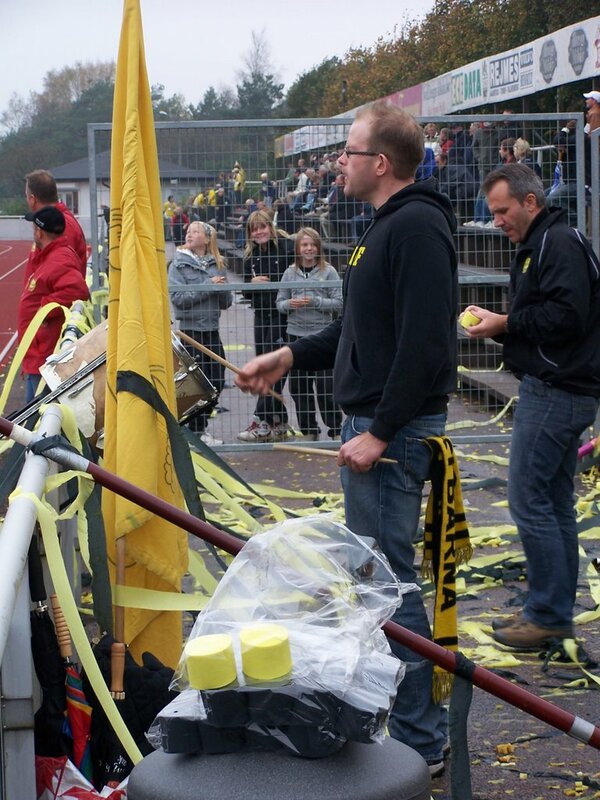 Mjällby is an automn team as we can see. 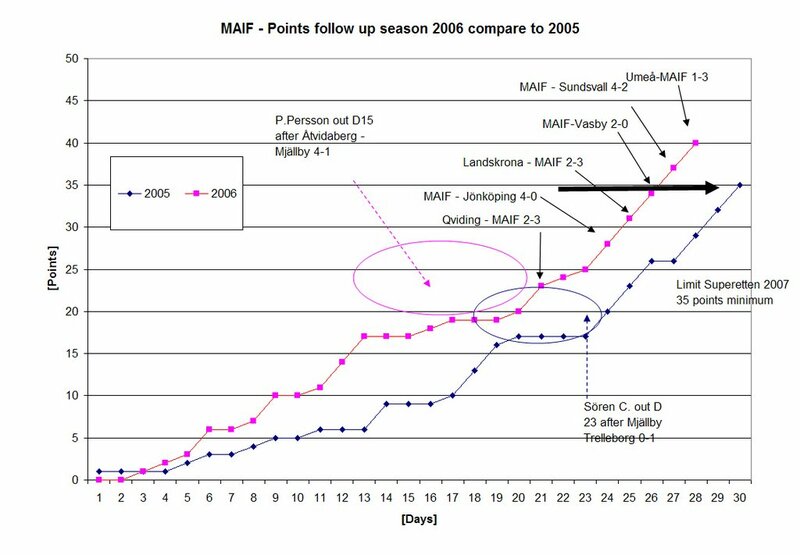 The 2 curves 2005 and 2006 are nearly the same. 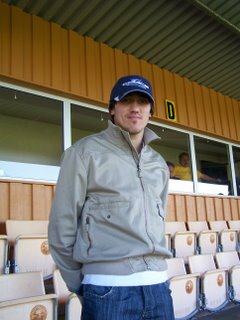 I had put the limit for new contract in superettan at 35 points based in the latest editions. There are still 9 points to take but bottom team will meet each other. So it´s done at 90%. 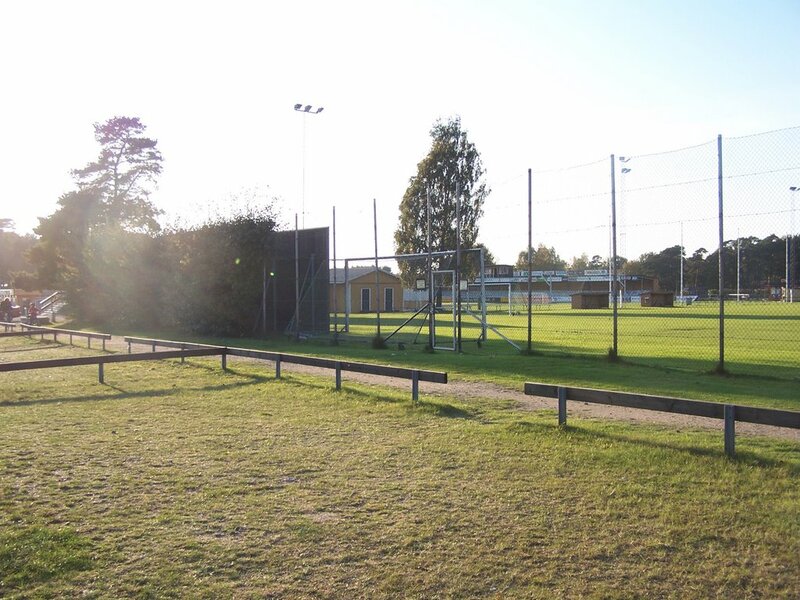 It means that the board can start to work on next season, players, training game etc..
Mjällby - Sundsvall 4-2: Eken-, Eken-, Ekenberg. What a dramatic game for the 2126 persons present at Strandvallen today. If there is one minute of the game that was not to be missed, then it was the 40th minute. Dahlberg, striker of Sundsvall, was sent off by the referee for a fault on Lindberg, elbow given in the face when Lindberg came back after a corner. 5 long minutes of discussion and anger by both teams. The referee and his assistents apparently didn't see the aggression, but it was the fourth referee that gave the information, which provocated the anger of all Sundsvall team and staff. Sundsvall, there is not so much to discuss about, the fourth referee is part of the game, and the rules are the same for everybody, ask Zidane about it!!! 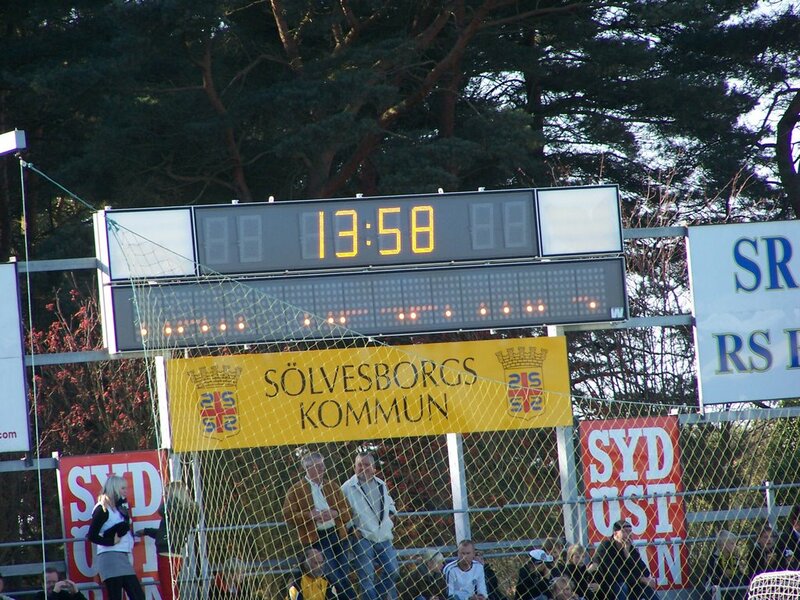 4 minutes later came the second event of the game, a penalty given to Mjällby after a fault on Olsson. Here also, nothing to discuss, Olsson was clearly pushed. 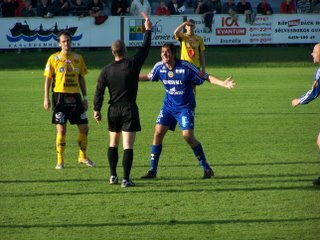 it provocated the second anger of Sundsvall player. Ekenberg scored for the first time of the game (1-1). Two minutes later, second goal of Ekenberg, after dribbling 2 Sundsvall players, a wonderfull lob where the goalkeeper had no chance (3-1). We could think that Mjällby would manage the game, but with maybe to much self-confidence, and a Sundsvall team that continued to push even with 10 players only, the second half-time was difficult. and happened what must come, penalty at 78th minutef or Sundsvall, scored by Bayat. (3-2). Even here, the fault was evident. 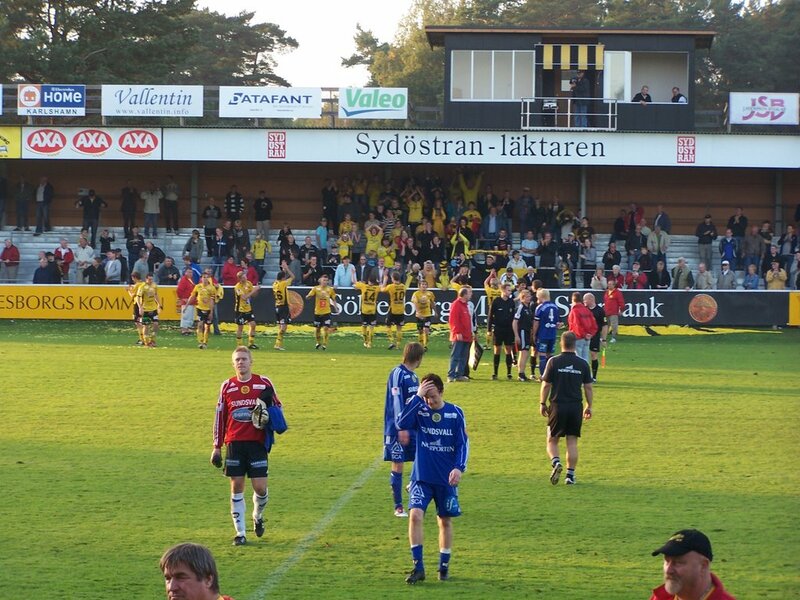 An important victory by Mjällby that insures probably the place for next season in the Superettan. Well done Guys!!! 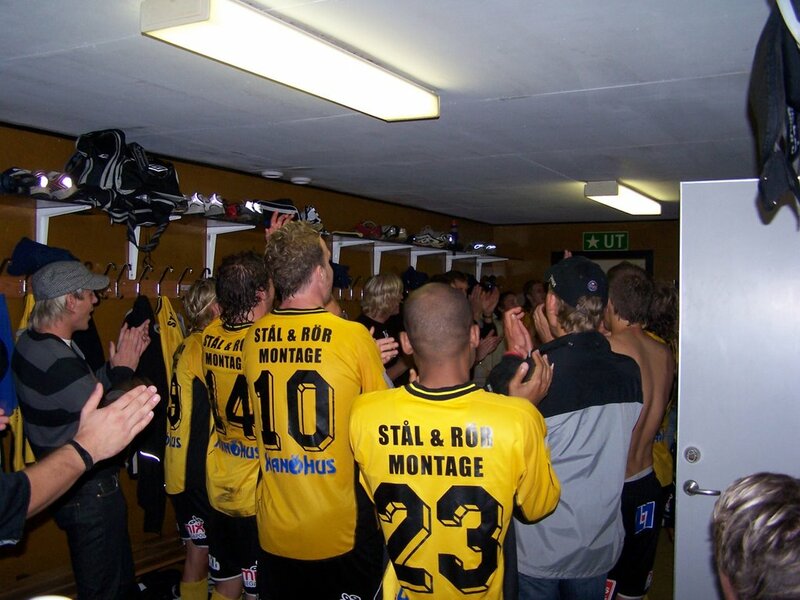 To notice that the players of Sundsvall were still angry after the game, and the security had to intervene. They are bad losers. the fourth referee is here to make sure that the rules are respected, and on the penalty there is nothing to say. Very dissapointing for a team coming from allsvenskan, but when you have a so "good" position in the championship, then you always have to find some excuses, and today was the referee. A special mention to the player of Sundsvall that was sent off, Dalhberg, that cried like a little girl who had lost her puppet. Away with this kind of players, they have nothing to do on a field! Very good management of Thomas and Hasse, that did very good substitutions. 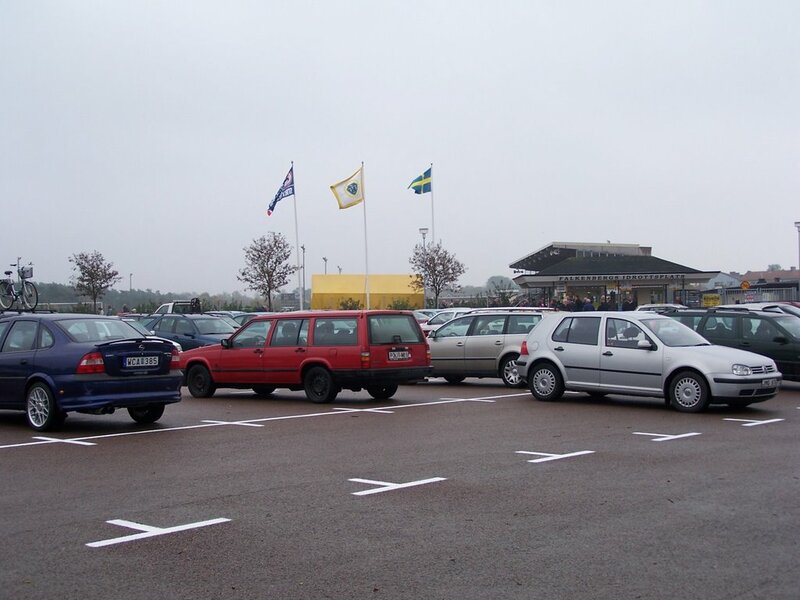 Persson by Malmström: he received a warning in the 2nd minute, and was under a second one. Hue by Jonasson, the jamaican player didn't do so much before his replacement: bad passes and choices, no running. it was time to replace him. 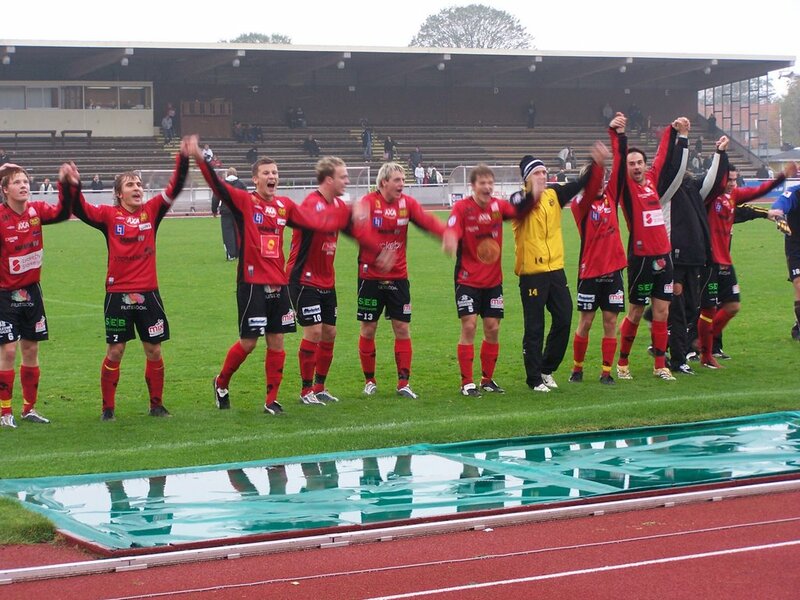 Next game at home in 2 weeks against Degerfors, that will have probably to fight to get maintained in Superettan. So it will be an interesting game. DON'T MISS THE PICTURES OF THE GAME TOMORROW ON OUR BLOG. 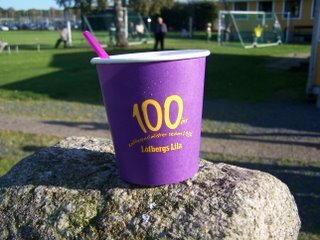 You will see all important events of the game: Dahlberg the "crying" player, the confusions after the red card, Eken the 3 times scorer, the joy of Mjällby's player...life is so beautiful.